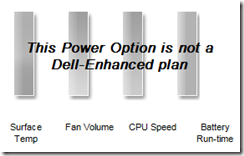 Headline: It seems that when the Dell Enhanced Power & Performance is used and you change to Ultra Performance (Max Fan Levels) it will shut down your desktop Gadgets. Switch back to something like “Cool (Reduced Temp Levels)” and they return! 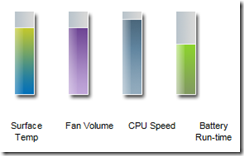 On my Dell Precision M4500 I change environments quite a bit. 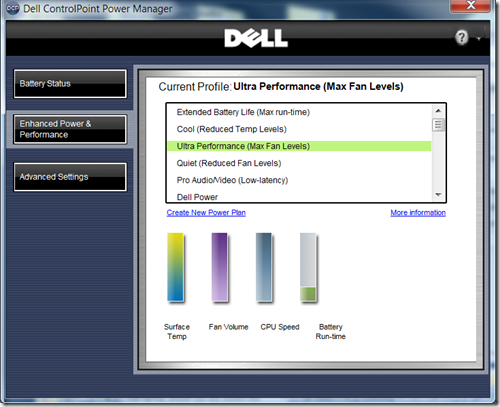 When I’m in the docking station, I always open the lid about 30 degrees to prevent the screen from getting too hot, then I put change my Current Profile to “Ultra Performance (Max Fan Levels)”. Other times I’m working undocked with the notebook (without the battery slice) on my lap, and I want it as cool as possible. Then other times I’m in a quiet environment (reading area of our house) and want to keep the noise down. 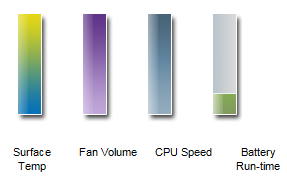 You can see some nice indicators for the Surface Temp, Fan Volume, CPU Speed, and Battery Run-time. 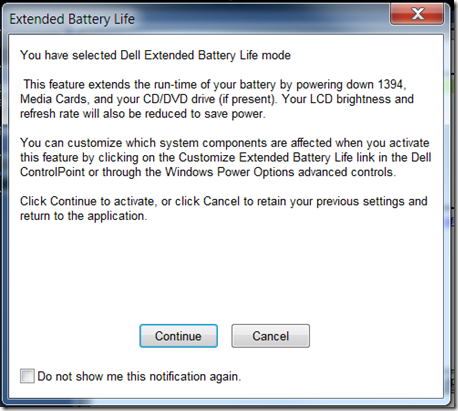 Since I have the Dell Battery slice and I’m near power most of the time, I’ve never actually used this mode. 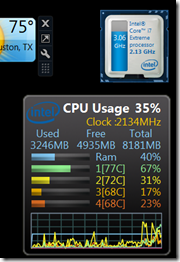 My Desktop Gadgets run and the temperatures seem to be in the lower 50s Celsius. 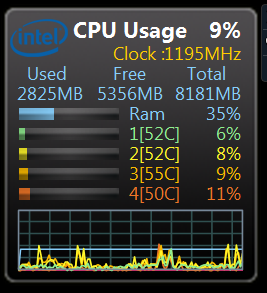 Note that my clock speed is also reduced to what seems to be the lowest state (I’ve never seen it below 1195 MHz.) 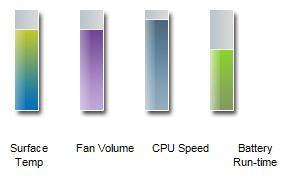 It seems to stay there no matter what I’m doing. In a more complete image below you can see that the temperatures jumped up too. 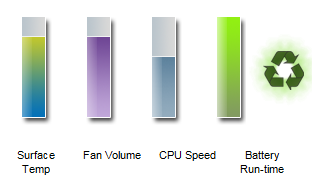 This turns my gadgets back on, and put the color scheme back to normal. 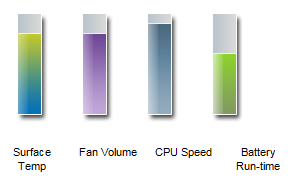 It seems that my machine runs in the low 60C temperatures when in this mode. This is a nice quiet mode. 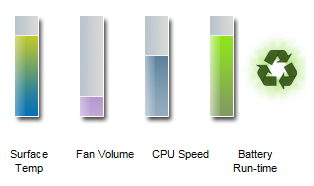 This turned off my gadgets and changed my color scheme to Windows 7 Basic. 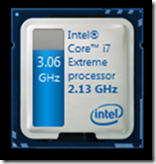 It seems like Ultra Performance in many other respects. These two options seem to be the same. 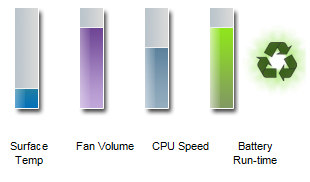 These seem to conclude the nice profiles that are shipped by default. If you figure out a way to create new profiles that allow you to control these items, please let me know… Although, I am pretty happy with what’s provided out of the box. So in the end the reason my Desktop Gadgets kept disappearing was very different from what others found (bad gadgets for example). Now I at least know what to expect. 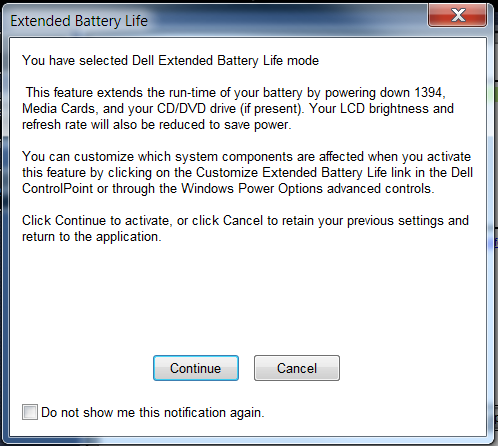 This entry was posted on Sunday, November 21st, 2010 at 1:37 pm and is filed under Technology. You can follow any responses to this entry through the RSS 2.0 feed. You can leave a response, or trackback from your own site. Could you upload the setup file of your machine? 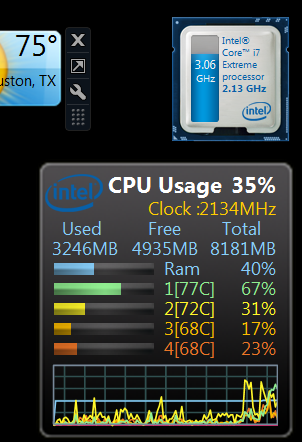 I don’t have a “setup file” for my machine. I’d probably need to download again. 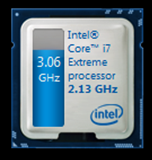 However, I have the Intel Core i7-940XM Extreme Edition 2.13GHz processor in my M4500 so the features provided by the processor might vary. Could you export and upload these as follows? I sent via e-mail. Let me know if you do not receive them. What is the application you use to track and monitor CPU Temperature Ram? 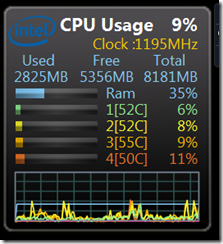 49 queries in 0.253 seconds.